I've included the 6120 ppd file to the driver so we can choice the 6120 options instead the 6200 ones. Though the driver patch is necessary too. My version is in german, others made it for english. Search on ecomstation newsgroups if you need it. I use this printer via lan since about 1 year. Works great, but makes some noise when printing or power up/down. Not a big problem but don't place it in the bedroom ;-) Text and picture quality is very good. 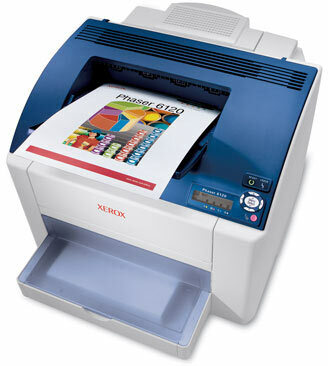 Photos are good compared to other laser printers or older inkjets, but of course not as good as with a good current inkjet model. I would recommend something with ethernet connection. My Xerox 6120 has color, ethernet, parallel and usb. It's easier to print from different computers if the printer is connected into the LAN. Since I have it, my 5L gets dusty. But most important it supports Postscript and PCL5. Would not recommend something without at least PCL5 (Postscript prefered). Although some Windows GDI printers work with Cups, it's much easier to set up a Postscript printer. If you want to stay with HP, look carefully at the specs. They have some color laser models which are Windows GDI only. That's the reason I didn't buy a HP again.